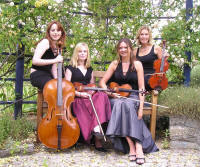 The string quartet is an instrumental form that is so perfect that it has survived by dint of its own qualities for over two centuries and will probably continue as long as acoustic instruments are played by real people (as opposed to synthesised music composed by computers and artificial intelligence systems). Many of the most famous classical composers have written their finest works for the quartet, many at the end of lifetime writing symphonic and other works, only writing in the string quartet form when they have achieved true greatness. So let us try and understand the style and form of the string quartet and explore the techniques of its performance. The string quartet form was an evolutionary development from the wealth of trio sonatas with continuo, (should I say basso continuo), and quartets for all sorts of instruments, many including woodwind instruments as well as strings. In the early days all of them included the harpsichord or similar continuo instrument which later became dropped in favour of the string family alone. Joseph Haydn is considered the father of the string quartet, I think you wrote something like a 144 of them, many of which, if not all of them, I have played at one time or another. Playing the whole enormous set is interesting because one can see the development of his style. As one would expect, the early ones were very much a violin solo with accompaniment, but as his style developed the second violin, viola and cello parts became much more important until eventually all parts were equally important with the melody being shared around the whole group. In fact a string quartet playing in cabaret mode, perhaps at a wedding reception, is quite interesting. One thinks of string quartets playing for formal concerts and the very important and serious occasions like church wedding ceremonies or civil wedding ceremonies and one thinks of a jazz band or jazz singer performing in a cabaret. But that needn't be the case. It's really quite unusual for a string quartet to play in a cabaret situation, but I've done it. My quartet did a series of concerts at a music festival where people came in and had afternoon tea as we played. The children with packets of crisps was a little bit unusual, with crackling of Smiths crisps bags accompanying the Haydn quartet. Another occasion that was quite cabaret –like was a wedding anniversary dinner that we played at, where Tables were dotted around in a cabaret style. Everyone was enjoying themselves and getting laid back, but it did get a bit silly when one table lot of people who had got rather drunk started flicking sweets at people on other tables, and when some of them hit our instruments we had to sort them out in no uncertain terms. Another very strange occasion when playing string quartet was when we were hired to play for one of the major drug companies annual families get together. We ended up playing Haydn and Beethoven and other string quartets whilst children skateboarders around the hall and adults tried to ride unicycles. It was completely surreal but really great fun, and as we all know from the film about the life of Mozart that was brought out some years ago, he enjoyed parties and in many ways his music is party music, even though it may be played at weddings and wedding receptions and serious intellectual concepts. However I digress, but perhaps not too far. I should mention here that some of the early string quartets of Joseph Haydn's are thought to have been works for string orchestra rather than string quartet, with four or six first violins, for six second violins may be to violas and to cellos. Plus of course the continuo part, often played in harpsichord. Two paragraphs above I mentioned Mozart and his love of parties. He didn't always have a good time. Reputedly the first string quartet he wrote, K 80, was written in a state of complete boredom as he waited hours in a rainy coach station in Italy on one of his journeys. Of course it wasn't a coach station with buses, but was a coach station for stagecoaches in those days. He was only 16 years old at that time. What Haydn and Mozart were doing back then was cutting edge stuff in musical terms. As late as 1777 Monsier Castillon wrote in the French Encyclopaedia of sciences, "that while there might be a real quartet of solo parts each with its own tune, it would be so confused that the most practised here would have much difficulty to distinguish each voice." So what has happened in the intervening years to the present day, where a Haydn string Quartet sound absolutely normal to listen to, even to nonspecialist musicians. Haydn string quartets are played during wedding ceremonies and wedding breakfasts, so they must be generally acceptable now. It must have sounded very confusing and difficult to listen to to most people at that time, as most cutting-edge music does when it is first aired. So what has happened to people in the years from 1700s to the early 2000s such that a Haydn or a Mozart string quartet can be played at a wedding anniversary and sound perfectly sensible, whereas when they were written it would have been quite shocking and avant-garde. Of course, populations get used to certain things. There are far fewer accidents on the roads now for the number of vehicles that are around compared with back in the 1960s and 1970s when one always saw bumps and scrapes on the roads. In part it's because of better road design and better car design, but it is in part because drivers of today were brought up being used to driving or being driven, being used to the speed of motor vehicles whereas back in the 1950s many of the middle-aged drivers or older had only started driving in their older years and were not used to handling high-speed motion and the relationship between high-speed vehicles.